In most working environments heating energy demand is relatively easy to calculate, based of the internal volume of the workspace and the ability of the walls to retain the heat, expressed as their U-value. There is a bit more detail in that the ceiling, doors and windows will almost certainly have different U-values than the walls, so they have to be calculated separately. As a general rule doors are usually closed, so their thermal insulating effect is nearly fully utilised. However, when a door is open, its effective U-value drops to zero. In loading bays the giant loading doors have to be open a lot of the time, so it is inevitable that heat will escape. There is a cost associated with this heat loss, which management will naturally want to control, which often leads to questions about the U-value of the loading bay doors. 1. Open and shut – Operational loading bays spend a lot of time with their main door open. Self-evidently, goods cannot be loaded or unloaded unless there is a truck in the bay, i.e. the door has to be open much of the time. 2. 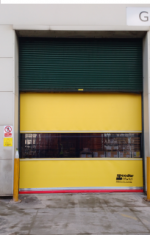 Door construction – Most loading bay doors are of the roller shutter or sectional overhead type, chosen because they provide a wide, clear opening that is unobstructed from all directions, easy to operate (often powered) and not overly prone to damage. However, such doors are made up of a number of parts, and while the panels and profiles can be insulated to a specified U-value, there will inevitably be joints between the parts where the insulating capabilities are reduced. 3. Door mounting – The door, whatever its type, will be mounted in a frame. Inevitably there will be a gap between the door and its frame, and typically this will be quite a significant gap to ensure free movement of the door in the frame. But it will also allow heat to escape. It is possible to fit insulating brushes or seals within the frame, but their effectiveness and longevity are limited. Theoretically it is possible to calculate the overall U-value of a closed door by summating the individual U-values of the door panels, the inter-panels joints and the gap between the door and frame. It is also possible in theory to do overall heat retention calculations that incorporate a value for the amount of time the door is open. However, experience shows that such calculations rarely reflect actual performance when measured by taking multiple temperature readings over a period of time in the loading bay. Probably the biggest reason for this is not so much the U-values, but the difficulty in accurately predicting the amount of time the door is open over a given shift, coupled with the near-impossibility of predicting the outside temperature (plus wind speed and other chill factors) at the times when the door is open. This is easy to understand at a theoretical level, but it can lead to a range of different reactions. Logistics managers, driven by a desire to handle goods quickly, efficiently and safely, tend to accept heat loss through open loading bay doors as a ‘necessary evil’. However, their colleagues in the finance department tend see the heat loss as an avoidable expense. To an accountant it makes sense to minimise heat loss by closing the loading bay doors as much as possible and making sure they have a good U-value. We are often asked for U-value calculations, however, the first thing we do is point out the practical difficulties and suggest that a long term survey is needed. As a general rule, we recommend a pragmatic approach. Take comprehensive readings at different times of the year (and at night if 24-hour working is required) and build up a thermal profile of the loading bay in general and main door in particular. There are then several approaches to consider. At the door opening, there are a number of technologies that could be useful, such as insulated doors, a secondary curtain door (often insulated and usually with high speed actuation), an air curtain or local heater. Another option that is often very effective is to fit an inflatable loading pod to the outside of the loading bay; when a lorry parks in the bay, the pod inflates to seal against its sides and top (although its underside remains open). Sometimes a simple side wall to break the wind and/or porch for rain protection will have a significant effect. A practical alternative solution we’ve encountered has been to heat the rear and centre of the loading bay and accept that the area around the door will be a cold spot. Working practices can then be developed that minimise the amount of time operatives spend in the cooler areas. In conclusion we can say that while it is understandable that managers want to control their energy spend, sometimes an overly theoretical approach will be counterproductive. The U-value of a loading bay door can provide a guide to overall heat retention, but it would be inappropriate to rely on this figure too much. It is far better to take a practical approach with real world measurements and real-world solutions.